San Marino, located in its namesake micronation, is often a day trip from Italy; spend time wisely in San Marino, and you'll surely conquer the whole place. If your mother doesn’t know where you’re traveling this time, send her a postcard by throwing it into one of the white mailboxes that may be found almost on every corner. Besides, such a letter with the seal of San Marino will be a great souvenir for any of your traveler friends. It is much more interesting than the ordinary fridge magnet. For just five euros, a stamp and the official mark of San Marino may be put into your passport for you surely not to forget that you have visited this tiny, charming nation-state. However, recently due to these “souvenir” stamps, some people started to have problems with processing future visas to Schengen countries and Scandinavia. In consulates of these countries, your international passport may be considered invalid due to foreign unofficial stamps. But there is a way out of this situation – if you’re a sophisticated traveler, take your old international passport with you and put a stamp in that. Then you can avoid potential problems and get this desired stamp. They say that San Marino has delicious, sweet wine, but we decided to try their homemade beer and have to admit that even their ordinary, bottled beer is very, very good. I cannot say exactly, but it seems that they have just three different brands, the most famous of which is Titanbräu; it may be found in any restaurant, and we totally suggest that you try it. By the way, buying and drinking alcoholic drinks in San Marino is allowed from the age of sixteen. The country is considered to be the oldest republic in the world; having gained its independence in 855 and existing still, you would have to agree that this is impressive. Therefore, its history is very interesting and exciting. The main historical sights of San Marino and its symbols are three towers – Guaita, Cesta, and Montale. The first two are free to get into, while the third requires that you’ll spend 3 euros. The third tower, unfortunately, was closed for tourists while we were there, but thanks to the other two, we were able to easily imagine the Middle Ages in San Marino. Each traveler is a pioneer by nature. If you want to please your inner explorer, surely get away from the common path. 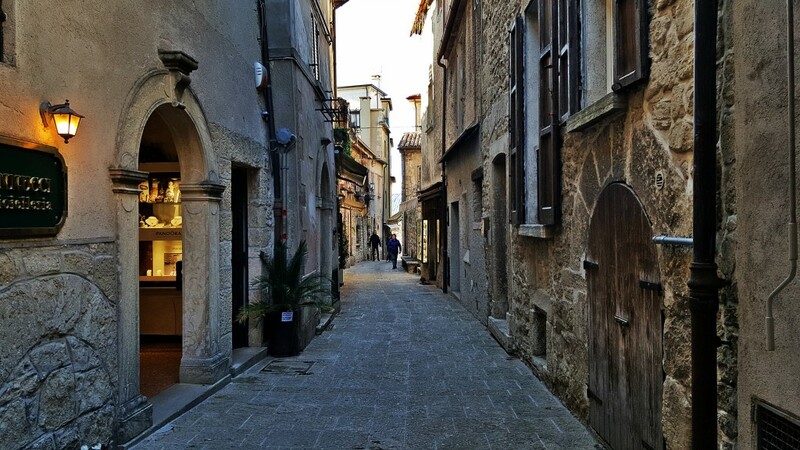 One has only to climb up stairs or turn into a passageway between the narrow streets, and San Marino will show you a completely different side. Of course, tourists have walked along and across the city, but in these very places you may feel the true spirit of San Marino and understand how the locals live. Despite the fact that the area of this tiny country is just 61 km2, here everyone may find something to his/her taste. I like big cities and had imagined how boring it might be in San Marino, but its landscapes with their stunning beauty did not leave indifferent even such a person as me. But if you still feel indifferent, you’ll probably like its narrow streets, neat tiles, beautiful mailboxes, and low doors, each looking like the entrance to a dwelling of hobbits. Find someone in your team who may be trusted with the task of photographer, relax, and have fun contemplating the world with your own eyes, not through the lens. If you find yourself in Italy, be sure to pick at least one day to visit San Marino, a fabulous town with medieval towers and charming streets that will make you believe in fairy tales once again. Mariia Kislitsyna is a Master's degree student, polyglot, and literature fanatic. She loves to write about travel and education stories in the hopes of learning more for herself at the same time. I would love to visit indeed! San Marino is a very beautiful place.